It’s another promising week on DavidNews.com blog. We still notice continuously increasing activity in the HYIP world and new programs join our monitor almost every day. Unfortunately, we also see HYIP’s turning into a scam. Let’s see who will be the movers and shakers in the HYIP world this week. Today I’m reviewing a HYIP called Racer Forex LTD. It has joined Golden Stage on DavidNews.com monitor 5 days ago and has been online in total for 12 days. Now I have reinvested in this program $400 and will keep you updated about the payment progress. Admin of this program must be a big fan of F1. You will understand my comment once you open the website. So far everything looks fine – fresh program with a fresh design. Keep reading to find out more about it! Some might say what does F1 racing must do with the forex trading. In fact, we can find a question to ask almost any HYIP admin. Therefore, I prefer interesting and creative web design examples like Racer Forex LTD, which stands out among many other websites in terms of web design and positioning. I mean, investment plans are very important, but it’s hard to impress a regular guy that has seen a number of HYIP’s in the past. Of course, it’s a matter of a taste. 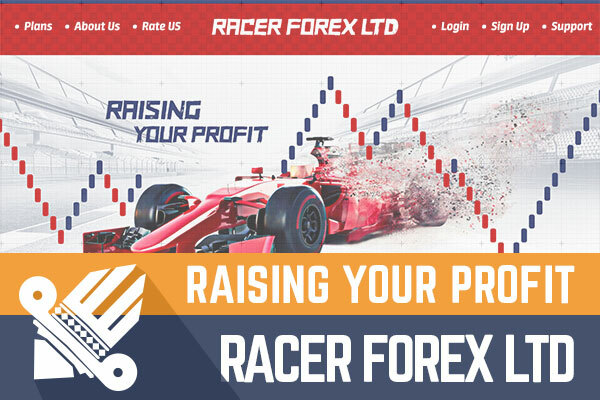 However, I think the web design has done a great job with Racer Forex LTD. The color palette, visual images, interactive elements – investment plan gas tanks, font style and text positioning – all these things are consistent and fit together perfectly! What else do we know about this website? It’s built using a licensed version of Gold Coders (ready to use HYIP scripts) and most likely is a custom-made design. Racer Forex LTD has SSL certificate from Comodo. Of course, it is a standard and I can’t remember a HYIP, which has no SSL certificate. Sure, there is always a space for improvements and this website is not an exception. I would expect such website to have a mobile responsive version. Unfortunately, it’s not. How are they going to keep the money on the table? 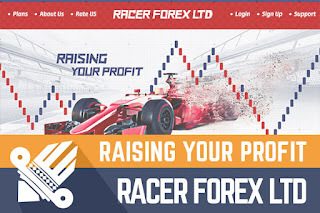 According to Racer Forex LTD biography on About us page, “Traders of the Racer Forex LTD has developed its own innovative strategy to work on the Forex market and successfully tested it in real-time. According to the results of trading session Racer, Forex LTD could get a high profit, despite the loss”. If we can believe the information about its launch date (12 days ago), at least three of the standard plans have already finished full investment cycle. Some of them even more than one cycle. Therefore, please drop a message in the chat box if there are any Racer Forex LTD investors among our readers willing to share their opinion about this program. In the meanwhile, you can read more about the company on their website. Racer Forex LTD admin has registered a UK company. Company address provided by the UK register called Companies House is different from the address on the Racer Forex LTD website. On the website, we see Baker street, but on the Companies House website – Greenford Avenue. You can contact HYIP representatives several ways – using the contact form, via online chat or by phone. Check out their website for more information. You need only a few seconds to look at these plans and say this HYIP is focusing mainly on the short-term investments. Even in calculations provided by admin we see examples of large deposits. Of course, the larger deposit – the larger profit. However, keep in mind that a large deposit means greater risk. Let’s try to understand investment plans offered by Racer Forex LTD. Basically, there are 8 plans in total. 3 of them are VIP plans, which have pretty high minimum deposit rates (from $5000). Therefore, let’s focus only on 5 main plans with more affordable minimum deposits. Withdrawals are processed manually within 24 hours after the request. First 4 plans have a minimum deposit of $20, but the 5th plan - $250. All these profit rates look great but I recommend doing your own calculations to understand the real profit. These 5 plans have different deposit terms and deposit is also included in these calculations. Moreover, we see that interest rates vary according to the amount of your deposit even within the same investment plan. In my opinion, it makes sense to pay attention only to Plan 1 in first three investment plans – after 1 day, after 5 days and after 10 days. After 1 day – Plan 1 has interest rate 4% a day. After 5 days – Plan 1 has an interest rate of 5% a day. After 10 days – Plan 1 has interest rate 10% a day. Of course, the longer the term is the greater risk of losing your money. Anyway, I would suggest avoiding any other investment plans. How much could we make in case this program will survive 5 days after the deposit? $200 invested in plan After 5 days would have interest rate 25%, which is 5% a day. 7$ daily profit and 35$ at the end of the investment term, which is quite ok for such short term. However, you need to be very cautious with these fast HYIP’s which return deposit back at the end because too many withdrawals can cause the collapse of the HYIP. Even though this program looks comparably fresh, there is already a buzz around it on the forum. What a surprise, right? In fact, lately, I haven’t noticed too many HYIP’s with fast investment plans. I believe there are some players hungry for quick investments. However, there is always a downside for any HYIP. In this case, large sums are coming in and out and cash flow is less predictable for the admin. All in all, Racer Forex LTD has an attractive website, the admin has done a homework by registering the UK company. Nothing much to add to the program anymore. I’m here to collect information and share my thought and I will never suggest investing in on or another program. Therefore, if you ever decide to make any investments, don’t invest more than you can afford to lose! Please drop a message if you have already invested and received your profit from any of the Racer Forex LTD investment plans! Investment plans: 104% up to 135% after 1 day, 125% up to 300% after 5 days, 200% up to 550% after 10 days, ignore other investment plans. Join Racer Forex LTD Here!